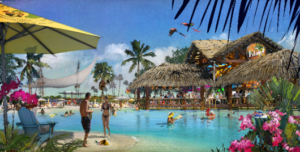 Orlando, Fla. –June 6, 2016 – Margaritaville Resort Orlando today unveiled its first set of renderings, giving travelers from around the world a license to chill as they start dreaming up their very own Escape to Paradise. 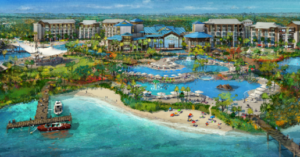 Construction recently began on the $750M destination resort, which is being developed by Encore Capital Management. The company’s sales center is slated to open in the coming days, with first phases of the project expected to open by the end of 2017. As shown in a new master rendering (above left), the expansive waterfront destination resort will be a welcome addition to Central Florida’s thriving attraction and tourism scene. Margaritaville Resort Orlando boasts a 175-room Margaritaville hotel, 1,000 Margaritaville-themed vacation homes, 300 Margaritaville timeshare units, 30,000 square-feet of function space, 200,000 square feet of festive retail space, a dining and entertainment district, a 12-acre water park, a wellness center, miles of wooded fitness trails and a destination water taxi system. The resort will also host destination weddings. 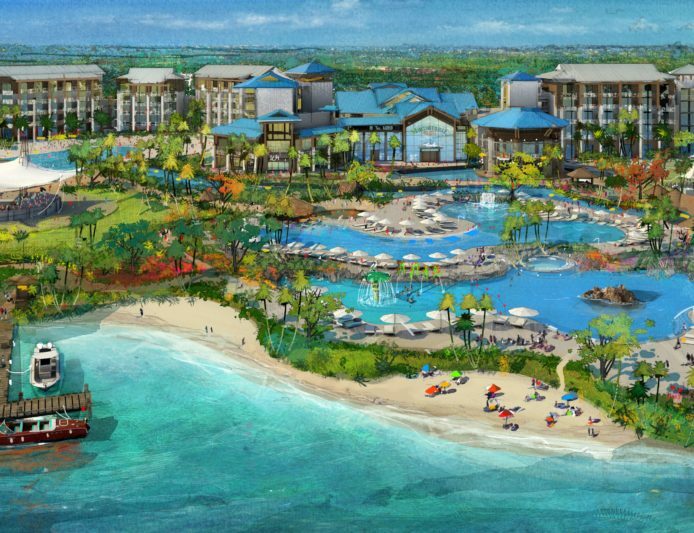 A second rendering (above right) shows perhaps one of the most exciting components of Margaritaville Resort Orlando – a three-acre swimmable freshwater lagoon. The lagoon features natural sand beaches, the first and only in Central Florida, surrounded by cabanas and filled with opportunities for water adventure, including paddle-boarding, snorkeling and more. Located on 320 acres along U.S. Highway 192 near Toll Road 429 in Western Osceola County, Margaritaville Resort Orlando is a first-of-its-kind vacation destination resort inspired by the lyrics and lifestyle of Jimmy Buffett and created for those looking to live the Margaritaville lifestyle. An array of additional details will be announced in the coming weeks, including information about the amenities, services and facilities that will be available to residents and resort guests seeking the ultimate in fun and escapism. For more information, visit www.MargaritavilleOrlandoResort.com or call 844–FIN–TIME (844–346–8463).